Cost for SLGC and AGC members is $25 paid in advance (deadline to receive checks is April 1st). We will email back confirmation of your check being received. Mail checks to Mikiko Fujita, 31100 Fairmount Blvd., Pepper Pike, OH . 44124. From April 27 - May 19 at the Allen Theater, Cleveland Play House will stage a hilarious production that takes to task that old phrase “good fences make good neighbors.” Native Gardens starts out as a squabble over a backyard property line that erupts into a full blown border dispute where “the defenseless flowers are caught in the middle.” You might enjoy a comic production centered around your favorite past time, gardening. The performance schedule can be found a www.clevelandplayhouse.com. Northeast Ohio Sierra Club Invites SLGC to Attend this Free Event! ARE WE APPROACHING THE NEXT SILENT SPRING? Rachel Carson raised the red flag years ago. Pesticides were not only killing insects, but also disrupting the delicate balance of nature. Now history is repeating itself. To commemorate Earth Day 2019, the Northeast Ohio Sierra Club extends an invitation to attend the enlightening program, "Next Silent Spring?" Laurel Hopwood, Senior Advisor to Sierra Club's Pollinator Protection Program, will show the outstanding documentary "Nicotine Bees." For more info, please contact Laurel at lhopwood@roadrunner.com . 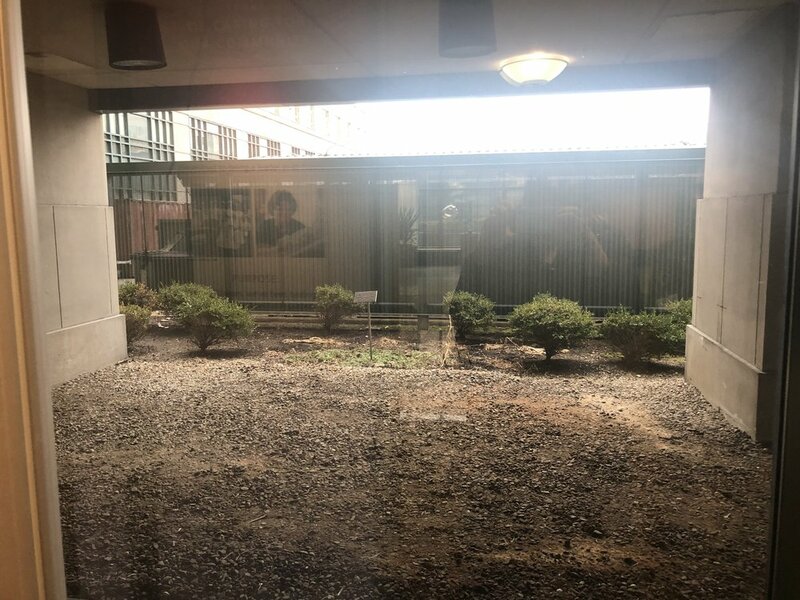 There is a garden at University Hospitals' main campus that could use some tender loving care. It sits outside a beautiful picture window and could be a really nice spot for patients, their families, and employees to relax and have some beauty in their day. Unfortunately, this area has been a little neglected. Would there be any interest among the SLGC membership to volunteer time to design and plant a garden in this spot? If so, please reach out to Caroline Emmet at emmetc915@gmail.com. The Nature Center is looking for volunteers to help with the annual plant sale on May 11. There are a variety of different tasks that are available throughout the day that you may be interested in helping with. Contact Kristina Arthur, volunteer coordinator, at 216.321.5935 ext. 237 if you have any questions or if you need more information. The Vero Beach Museum of Art’s recent “Art in Bloom” exhibit featured flower arrangements inspired by various Judith Leiber purses. There was a sighting of Sarah Dimling, Laurie Jacobs, Mary Anne Liljedahl and Cheri Pace at the Kips Bay Decorator Show House in West Palm Beach, Florida, on Valentine’s Day. 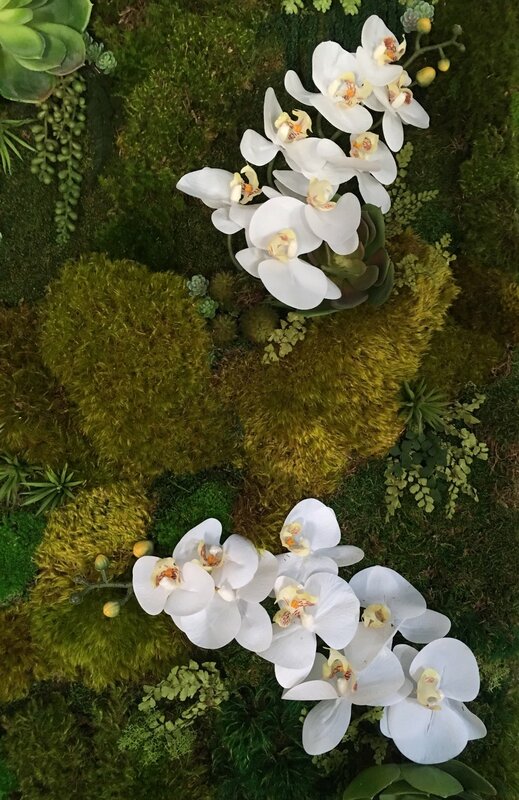 An intriguing vertical garden of moss, succulents and orchids adorning the side of a large circular staircase made an artistic statement and got the attention of the SLGC ladies. Ever heard of Lesser Celandine? Click here to read an article sent in by Suzy Hartford that may have you doing some serious eradicating in your yard. Check out this article from Horticulture Magazine, sent in by Robin Schachat. Worried About Pesticide Residue in Food? from Robin: A new study in a peer reviewed journal has just been published, showing important results. People who switched to an all organic diet reduced the amount of four major classes of pesticides in their bodies by over 60% in less than a week! Americans have been shown to have very high concentrations of pesticides in our systems as a general rule, many of which are clearly associated with cancers and other systemic disorders. Now we know that eating organic foods makes a huge difference. So sign up for your organic CSAs for this summer, and buy organic! For more information, check out the report here. from Robin: The New York Times recently published the US Government's Fourth National Climate Assessment. Read it here. Do You Know the Dangers of Volcano Mulch? from Suzy: Read all about it here. FLU SEASON IS NOT OVER! The best way to avoid catching the flu is to wash your hands.